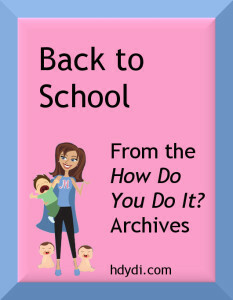 back to (pre)school theme week Archives | How Do You Do It? There are moms who pack works of art in their kids lunch boxes every day. And then there’s me. The fanciest I get is scribbling an “I love you” or “I’m proud of you” note, in permanent marker, on my daughters’ paper napkins. My girls actually like the lunches served in the school cafeteria, and they’re not terribly expensive. They’re not as nutritious as I’d like, though. While they do tend to feature whole grains, there’s a lot of processed meats and fruit. School also offers free breakfast to all children, which helps all the kids by keeping their classmates from being hungry and unfocused during the day. The breakfasts are terribly sugar-laden, so I prefer to balance them with a more nutritious meal from home. I allow the girls to choose to eat school lunch once or twice a week. The rest of the time, I pack lunches for them. Every lunch consists of some basic components. It’s tempting to leave the protein out of a child’s meal, especially when it’s hot out, but kids need protein for growth and cell repair. Just make sure you keep it either hot or cold for food safety. We’re unusual, I know, but vegetables and fruits are the easiest things for me to find for the kids. J is partial to jarred mandarin oranges and M can’t stand them. M likes applesauce, and it makes J gag. The kids don’t have to have identical lunches. My girls are now old enough to appreciate my efforts to personalize their meals, so if I pack oranges or grapes for J, M gets apples or spinach. Apart from applesauce and corn, my kids refuse cooked vegetables, so I don’t try. When school starts up in the summer, we’re still dealing with 100 degree temperatures here in Texas. Food safety is paramount. I generally stick with cold lunches and use ice packs or frozen juice boxes to keep food at a safe temperature until it’s ready to eat. It’s easier to keep food cold if it starts cold, so packing lunch the night before and storing it in the refrigerator overnight makes the morning that much easier. J has also recently developed a taste for ice cold water, so we put her water bottle in the freezer at night so she can sip it throughout the day. It melts fast. Very rarely, I’ll include a sweet treat in my daughters’ lunch. My favourite Texas grocery chain, HEB, makes a delicious store brand digestive biscuit with 3g sugar per cookie. Target’s Archer Farms brand has fruit strips made of fruit, without any added sugar. Every so often, I’ll drop in a small piece of chocolate, but only when it’s cool outside. There are a number of options for combining a whole grain, protein and fruit or veggie into a meal. Cook up some protein with vegetables and rice, pasta or barley in an unsalted broth for a hearty soup. Wrap refried beans and shredded cheese in a tortilla for a simple burrito. Mix up leftovers to make a fine fried rice. That old standard, the sandwich. My kids call them “homemade lunchables” when I pack up Ritz crackers with sliced meat and cheese for them to make their own minisandwiches. I wish my kids liked more adventurous meals. Apart from the soups and burritos, I’m not a big fan of the meals I pack for my daughters to take to school. They like them, though. I admit that I’ve been looking forward to the day or two I’ll get off packing lunches after a full summer of packing their food for camp every day. Do you pack your kids’ lunches? What do they like? If there is one topic that comes up in twin-Mom blogs, forums and groups more than any other, it is whether to separate your twins in school. It’s a hot topic and everyone has their own best answer. There are laws on the books in many states allowing the parents to choose, but in reality it comes down to the principal and teachers’ willingness to do what is best for the kids. Parents argue, teachers argue, each side cites studies and anecdotes. Before I was a Mom of twins, i probably wouldn’t have put much thought into it. When my boys were born it seemed so far away, and there were so many other, more pressing matters, like sleep. Fast-forward to age 3-almost-4 and we’re on the precipice of preschool. But the decision to separate was made for me, without any real choice. Whether I could or would choose to put my boys in separate classes in kindergarten and beyond, I know for certain I would not have chosen to separate them at age three. Starting next month my little boys, my babies, will be starting preschool in two different classes, in two different schools in two different parts of town. 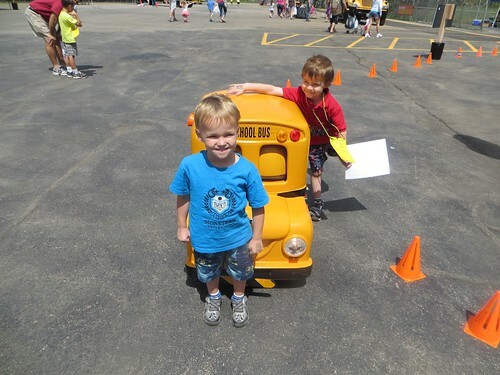 My other son will be attending a local private preschool, the one we intended for them both to start this year. 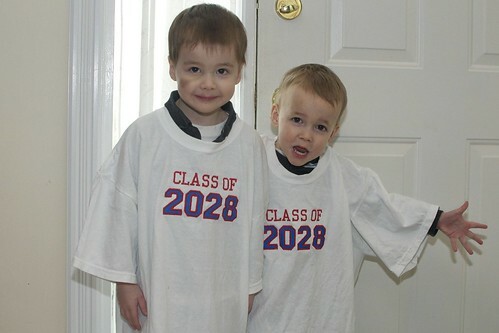 As luck would have it, some of our closest twin playmates will also be in that class. He will be going only two days a week, one of which overlaps with his brother’s school days. We have been trying to build it up all summer as a great chance to do fun things at school and how amazing it will be to run home and tell your brother. But truly, it kills me to separate them. I know they are very attached to each other. The few times we have split them up to run errands or take them to an appointment, they only worry about the other. One will tell perfect strangers in a store about where his brother is and what he is doing at the time. They speak in plurals “we would like a snack.” and do everything with the other in mind (like swipe two yogurts from the fridge, one for each!) We had a brief separation in swim lessons when one kid moved up to the next level and the other wasn’t quite there. The instructor asked if we preferred to hold the one back until they were both ready, but that didn’t seem fair. The first class they were apart the one who wasn’t quite ready refused to go in the water and cried the entire 30 minutes. He also refused to do the lesson the next three weeks. So in a few weeks, I am going to load up my 3-year-old with a backpack full of school supplies (My Baby! School Supplies?!?!) and put him on a school bus (which I am told is outfitted with car seats for little guys.) while his brother and I wave from the lawn. On alternate days I will wait for the bus and then take the other kid to school in our not-a-school-bus Minivan. (and if you don’t think that is a Big Thing then you don’t know 3-year-old boys.) They will spend 15 hours a week apart. Neither will have his brother there when the class celebrates their birthday. My heart breaks for them. When we talk about school starting, one will invariably say, “But I will miss my brother!” while I fight back tears. It will be great to finally have one-on-one time with each, but I can’t help but feel the other will be missing out. Or maybe we will be missing out while he is having a blast at school. One of the arguments I have read so often about separate classes for twins is that they are different people and need different experiences, but can find each other at recess or lunch and still maintain their bond. I love how close my boys are to each other. I want them to excel and I want what is best, but I also want them to have each other and not feel like we are taking one away from the other. Will this be great for both of them? Absolutely. Is it going to be the toughest adjustment we’ve faced so far? Undoubtedly. But I hope we can get each the level of help he needs to excel in school, and we will all work together so that maybe, just maybe, I can exercise my right as a parent to chose whether or not they will be together in Kindergarten after all. Jen is a stay-at-home Mom of 3-year-old twin boys who have already packed their backpacks several times with favorite toys and random treasures, ready to start preschool next week. Their adventures are (intermittently and mostly in photos) blogged at goteamwood.com. I distinctly remember one of the most frequently asked questions during my pregnancy was, “Are you going to dress your twins alike?” I really hadn’t given much thought to it, and I’m pretty sure I gave a pretty vague answer. At our baby showers, we got lots and lots of duplicate outfits. Thus, much of the girls’ first year was spent with them looking much like each other. When I finally started buying the bulk of their clothes myself, I found them matching about half of the time, and the other half of the time, they wore coordinating outfits. For the last couple of years, I’ve let the girls choose what they want to wear. Some days one will say, “I want to look like Sissy,” and some days they’ll choose something different from each other. With the exception of a few more formal situations where I like to select their outfits, this has been fine with me. And then it occurred to me…while it’s super cute to most adults to see pint-sized mirror images, matching from head to toe…that might just seem a bit “odd” to the average preschooler. Between this and my motivation to try to help the girls be seen as individuals, I promptly went shopping to expand the girls’ back-to-school wardrobe (after I’d originally vowed they had more than enough clothes to start the school year). I wanted to make sure they had plenty of non-matching outfits, at least to get them through the first month or so of school. There were a few times I allowed my girls to wear matching outfits to school, but it was long after their teachers – and more importantly, in my mind – their classmates, had gotten to know them as individuals. This was definitely the most thought I’d ever given to the girls’ “clothing strategy”, and I felt really good about where I’d landed. Do your multiples dress alike? Does that change based on the situation? Do you think it impacts how people view them? MandyE is mom to 4 1/2-year old fraternal twin girls. She blogs about their adventures and about overthinking parenthood at Twin Trials and Triumphs. Toddler started preschool on August 1st. Though it wasn’t time yet for me to return to work, I wanted to make sure she got a few days with me nearby just in case. I didn’t know what to expect, especially since she would be napping without me away from home, which was something she’d never done before. Suppose she started to panic and freaked out when it was time to sleep? Suffice it to say that I was anxious. The only other time she’s been in the care of someone other than her parents or grandparents was briefly about a year ago. Last summer when I was about 5 months pregnant with her siblings, we tried sending her to a daycare/preschool. The thinking then was that I wouldn’t be able to take care of her at home along with infant twins, so she would need to go somewhere else. In case I was to choose to be a permanent SAHM after the twins were born, I wanted to free up my mom to go back to a full time job. We also thought maybe it would be beneficial for her to interact with some other kids. So I decided to try it out for only 3 hours in the mornings. I would get up with her to get her ready, Daddy would drop her off on his way to work at about 7:30am, while I went back to sleep for an hour or two (I was so exhausted all the time), then maybe run some errands before picking her back up at 10:30 to come home and nap at 11. We only lasted two weeks on this arrangement. The teachers were very loving, everyone spoke Mandarin, all the kids were super well behaved there… but ultimately we still felt our daughter was too young to be without us. My mom agreed, so we brought her back and she’s been home for another year (back with my mom for the 6 weeks of school I taught last year). I didn’t plan for it to be so long, but it turned out that Husband stayed home for 3.5 months after the twins were born (long paternity leave, then a job change) and was a great help. And though twin babies plus Toddler is definitely no joke, with not a whole lot of income or any extra time, I just didn’t get around to figuring out this school thing. But it was great. I got to experience all of Toddler’s age two: I was able to take her to Mommy-and-Me and swim lessons, I got to watch her become her own little person, and I was present to shape a time that I feel is very critical developmentally. I’m so glad that is how things worked out. But now she’s three, I’m going back to work, and this summer keeping her home was feeling like I was holding her back. She’s ready, has been ready actually for quite a while now, for the more structured environment of school with peers. I was still a little reluctant, because I knew that she would be picking up coughs and runny noses from school, which she would then bring home and give to her baby brother and sister, and of course I would miss her terribly. Even worse, I would no longer have complete control over what she did every minute of every day. But I definitely couldn’t give all three kids to an aging grandmother, much as I wanted to. And mostly, she was ready. So, I researched and visited many preschools. In fact, I visited her preschool no less than 5 times, at various times of day, and spoke with all of the caregivers. I took her along with me most of those times, so she became pretty familiar with the teachers and layout of the school. Actually, the last couple of times she was reluctant to leave, because she wanted to stay and play. My biggest concern was the napping. I thought maybe I would ease her into being able to sleep there without me by sending her only half day for a week, staying with her for the first few mornings, and then transition her to full day. I figured since she’s so independent, once she was comfortable and trusted her teachers she would shoo me away. I had a couple of weeks before school started, and I didn’t think it would take that long. But the director of the preschool cautioned me against that plan, and all the teachers advised me against it as well. Apparently kids are much more adaptable than adults, and it is better to just let them figure it out on their own. I didn’t want to unnecessarily prolong her adjustment, so I agreed to full day from the start. I was careful not to let my anxiety show of course. To her I always discussed the whole school thing with lots of excitement, making a big deal about how she’s such a big girl, and that all her friends from Mommy-and-Me are also going to start going to big kids’ schools. I told her that sleeping at school will be so fun, and she’ll have a little cot just like camping. And she would get to run around, and there would be snacks, and she would make new friends, and when she was tired from playing Mama would come and pick her up. I wasn’t so sure about all of this myself, but I guess I was a pretty good actress because she didn’t show any sign of apprehension. Wha??? I really thought she must have meant something else at first, but indeed she wanted me to leave. I told her I had to walk her in so I could sign in and say hi to her teacher, which she then let me do. Upon entering she immediately ran to pick a cubby for herself, placed her bag in it, and then she was off to play. I was barely able to get her back for a hug and kiss before I left. I drove all the way home shaking my head in disbelief, and I still can’t believe that happened. Since then all mornings are Huggy-huggy-kissy-kissy-loveyou-bye! There were a few days when she was confused why she was going to school every day instead of twice a week like Mommy-and-Me, and a couple of mornings she asked to go with DiDi MeiMei to Grandma’s, kind of teary-eyed. But really she’s done incredibly well. My own transition back to work is still ongoing, but hers has surpassed all my hopes. No behavioral incidents, eating great, fully independent in the potty, and happy all day long. At 4pm I pick her up every day, and she gives me the wildest greetings, yelling Mommy! and taking a running leap to jump into my arms. We recount what Mandarin lesson she’s learned that day on the drive home. Despite all my earlier trepidation, this was the right move for us. Here are a few fun back-to-school themed Pin Boards we’ve shared on Pinterest. We’re just getting started pinning, feel free to follow along! Ahead of my girls starting three-year old preschool last fall, there were pages upon pages of information for me to complete…times two, of course. In addition to the medical history and six degrees of contact information, there was a blank space where parents were invited to share any insight they felt would be helpful to the teacher. I fought against my instinct to tell the teaching staff how brilliant my girls are…how precious are their hearts…how I love them to infinity and back (as we say in our house)…and how I was nervous as a cat about entrusting my biggest blessings to the preschool for six hours a week. Instead I tried to focus on concrete examples of the girls’ background that I thought could influence their time in the classroom. I wrote about this being the girls’ first time away from me, save for our college-age sitter who comes one afternoon a week. I shared that we have play dates with friends from time to time, but that preschool would mark their first time in any sort of organized group. I noted our discipline strategy (1-2-3 Magic), and that “while some days are better than others, in general, our girls are well-behaved”. Finally, I noted that we don’t watch TV and we avoid character marketing, so Dora, Thomas, and any of the Disney characters / princesses are unfamiliar to them. After a lot of deliberation, I chose not to share any insight into the girls’ personalities. At home, Baby A is the more dominant one. If given the opportunity, she will make all the decisions for the household…what to wear, what to play with, what books to read, when to rest, and when to run at full speed. Baby B has always been very conciliatory to her sister…she is usually very content to go along with her sister’s direction, even if it means giving up the toy she’s playing with, or forgoing her favorite book at bedtime. Out and about, B is the more social of my girls, though. While A will only speak if she’s really in the mood, B is much more likely to “perform”…to wish the sales clerk “Good morning,” to answer questions about how old the girls are and who is the older of the two, to place our bagel order at our favorite bakery. At home I do my best to manage the girls’ personalities. We have a “kid of the day” who gets to make most of the daily decisions. I try to keep an ear on the exchanges happening in the play room, to make sure B isn’t always getting bulldozed for the more coveted toys. Out and about I encourage B not to speak for her sister, to give A time to answer questions that are directed towards her. Might this be valuable insight for the girls’ preschool? Certainly I think it could have been. But I chose not to share it. Instead I chose to let the girls’ personalities reveal themselves as they would, recognizing that the dynamics in an unfamiliar / group setting might be different than those at home. So what did I learn??? When I had the opportunity – apart from the girls – I always asked their teachers how they behaved at school in relation to each other. I was amazed – and thrilled – to hear consistently that they both held their own in the classroom. They played with each other sometimes, but just as often, they played with other kids. They were kind and polite and helpful. And what I loved hearing, most of all, was how they took care of each other. They were each concerned that they both got stickers at the end of the day, that neither forgot their jackets on the playground. I heard several accounts of how one would “babysit” the other’s doll while she went to the bathroom. The teachers thought that was the cutest thing ever. There was never any mention of dominance or dependence. We still have our dynamics at home, but it’s so heartwarming to see how the girls support each other away from home. In hindsight, I’m glad I made the decision not to predispose the girls’ teachers to thinking about them in a certain way. Kiddos have a way of surprising us, as I was reminded by seeing my girls through another’s eyes. MandyE blogs at Twin Trials and Triumphs. 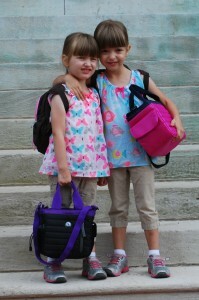 Her 4 1/2-year old fraternal twin girls have just started their second year of preschool. This was a discussion I had with my 7-year-old daughter, J, while grocery shopping. Photo Credit: Ian A Kirk. J: I have butterflies in my stomach. Me: Hunger butterflies or nervous butterflies? Me: What are you nervous about, sweetie? J: I never had a teacher I knew before. I’m worried that I’ll forget how to behave. Some context: M and J are starting 2nd grade today. Their homeroom teacher is M’s best friend’s mother. Over the last several months, she and her husband have become close friends of mine and made my girls feel like family. My daughters have spent several full days this summer at their house and even slept over. On one occasion, their new teacher, Mrs. H, picked them up from summer camp when I had an appointment, even though her own daughter was spending the night at her dad’s and wasn’t home. Me: What do you think might happen? J: Well, I’m used to being the… the example of… well-behaved. Actually, perfectly behaved! Me: So how would it be different with Mrs. H? J: It’s just different because I know her. Me: My advice would be to listen first, then act. J: Act? What do you mean, “act”? Like put on a monkey show or something? Me: No, I mean to do something. Listen to the instructions first, then follow them. Mrs. H isn’t worried about it, is she? Me: Well, if she’s not worried, there’s probably no reason for you to be too concerned. Me: Why don’t you give me an example of a situation you’re concerned about, and we’ll figure out how to handle it? J: Mom, I’m a role model. Me: I know you are. Just make good choices, and it’ll be okay. You may recall that I wrote about how the most well-behaved kids may act out with the people they feel safe with. J’s concerns seem to underline that point. Mrs. H is safe harbour and practically a member of our family. To have to behave with her as a teacher has J flustered. J knows that she’s been pushing the boundaries with Mrs. H in a way that she would never do in the classroom. We have made some efforts to maintain boundaries over the summer. My daughters call their new teacher Mrs. H, even as they refer to her husband by his first name. Mrs. H’s daughter won’t be in her home room, but due to the nature of the dual language program all 3 kids are in, she’ll be teaching her daughter for part of the day. Obviously, she’s well aware of the issues that may arise. At Meet the Teacher night last week, Mrs. H found a quiet moment with my daughters and another close friend of her daughter’s to let them know not to be surprised if she was stricter at school than she was at home. Obviously, if J hadn’t been thinking about the issue before, she was then. The bigger thing that struck me about my conversation with J was how certain she is of her role in the classroom. She’s the kid who is perfectly behaved, the best reader and the most enthusiastic learner. Talk to M, and she’ll tell you that she’s the math whiz, fastest runner and best listener. My daughters are in 2nd grade and they already know where they fit in the classroom pecking order. Like me, they are the disgustingly obedient nerds. What about those kids who, for whatever reason, have internalized other, less positive labels? Mrs. H asked for a particularly challenging student to be placed in her class so that she can try to break through to find the source of his acting out. It’s the rare teacher that does that. It honestly never occurred to me that these things would already be set going into 2nd grade. Even while it saddens me somewhat to see my daughters pigeonholing themselves already, I remember that this is exactly the sort of social skill my kids will need in their adult lives. This sort of thing is why I was happy to see my kids “held back” with their age peers instead of pushing on ahead in a grade with kids a year older. When their father insisted that our children attend public schools, it was so that they would have a broader view of the types of people in our community and better appreciate the resources they have, including their talents, to give back to others. How do you feel about kids labeling themselves as academics, jocks, or other things in elementary school? How would you feel about your child having a friend for a teacher? It’s time for a new school year in the US. Some of The Moms’ kids are going to school for the first time, while others are old hands at this. Some of us have kids in public elementary schools, while others are structuring in-home pre-schools or homeschooling older kids. All week we will be sharing posts old and new on Back to School. And if you haven’t already, please join us over on our HDYDI Facebook Page to continue the discussion. If you’re going to read one post on twins at school, please let it be Dr. Segal’s. She is a researcher and expert in twin matters, and her post is a thoughtful examination of the realities of multiples’ experiences at school. A Myriad of Multiples (Mercedes) One school has a remarkably high proportion of multiples. About School, Part 1 (Hanna) Hanna’s son is ready for school, but not the length of the school day. The GOOD ENOUGH Mother (Dr. Lisa Mazzio) It’s okay–good, even–for moms not to be perfect. Ask the Readers: How Do You Do It? (Jenna) How do you label your kids’ things for school? Daycare Passage (Sadia) Sadia and her kids say goodbye to their beloved daycare. 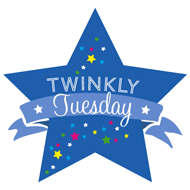 Lazy Mama Preschool Tips (AmberD) When Amber’s oldest didn’t make it into Mothers’ Day Out, she came up with a preschool routine at home to balance her infant twins’ needs… and her own. The Preschool Process (Reanbean) Reanbean shares some excellent tips on selecting the right preschool for your family. Preschool, Food Allergies and IEP’s “OH MY”! (Laraplus2) Lara enters the uncharted waters of public school bureaucracy. Preschool at Home with Toddlers (Jen Wood) Jen tells us how she went about structuring preschool as a new SAHM. Prepping for Preschool (Reanbean) Introductory activities before the official start of pre-school are helping Reanbean’s more reserved son with the transition. Speech Delays and Multiples (Jenna) Speech delays are more common for multiples than singletons, for a variety of reasons. Jen B‘s boys have had a pretty rotten time at school, with their teacher seeming not to see the value in being able to tell them apart. Sadia‘s kids have had more than their share of excitement related to school placement. She’s also captured other moments in J and M’s experience at school. Are your kids headed back to school? How’s it going?